February is the month for preserving the summer bounty in Australia, unfortunately in Sydney this is also a month of hellish heat and humidity, the making and bottling of chutneys, jams and sauces is always a sweat drenched affair. At the end of last week we had a brief respite from the heat and I decided to seize the moment and preserve something… anything to take advantage of the cool spell. The end of season peaches have been particularly good and cheap this year so I was keen to something that had a longer shelf life than baking or poaching them. My first thought was jam but we don’t eat an incredible amount of jam in our house and peach jam doesn’t have the same pull for me as raspberry or apricot jam. 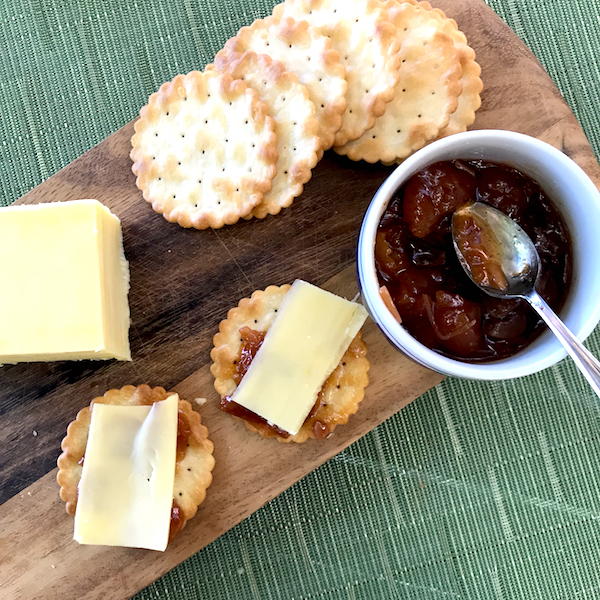 Peach chutney though has an old fashioned vibe and a good homemade chutney is always special. I googled peach chutney but didn’t get that inspired with any of the internet offerings. I didn’t want to waste my time making a dud, when I remembered this superb Parsi chutney recipe from Niloufer Ichapouria King. 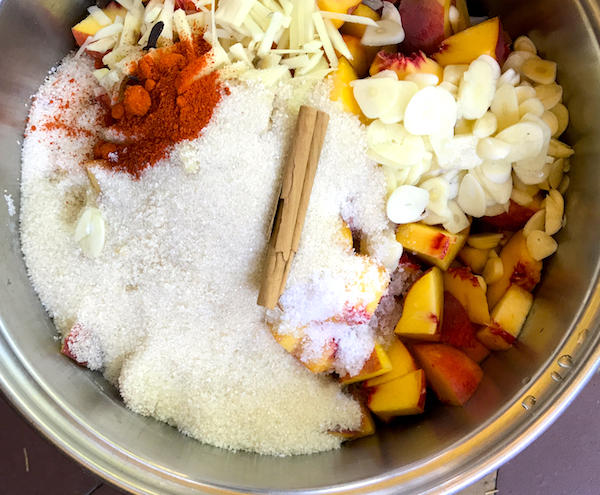 I usually make this chutney with tomatoes but this is a master recipe and can be used with any number of fruits – apples, quinces, cherries, nectarines and peaches! This is a great a great fail proof chutney. I’ve got a few more preserves I want to make this February so I held back on my usual excess and made a single batch, which makes about four 250 gram jars. (I always recycle my Meredith Goats Cheese jars which I’ve got a plethora of). I’ve still got a bit of back log of peaches to work through, and the heat and humidity has returned, so I’m thinking this simple iced peach tea from the Minimalist Baker is the way to go next. Place all ingredients apart from the grated orange peel in a large saucepan. Add only 1 tablespoon of chili powder to begin with you can add more later according to taste. Bring to the boil and simmer, stirring occasionally for about two hours until the chutney gets thick and jammy. If you’re doing a double batch this process usually takes longer. As the chutney gets thicker, stir more frequently it can burn quickly if the heat is too high. Once the chutney is cooked add orange peel (if using) and adjust chili, salt and vinegar to taste. You can leave the chutney to cool and adjust flavorings if you wish. You want the right balance of spicy, sweet and sour or Niloufer Icahporia says it should ‘light up your mouth’. Once you’re ready to bottle bring the chutney back to the boil for two minutes and fill warm *sterilised jars with hot chutney. I always put the lids on tight and turn the jars upside down to allow the chutney cool. *I sterilize jars by heating them in 120C (250F) oven for 20 minutes and boil the lids in water for 20 minutes. That looks delicious. We had a glut of peaches and nectarines last year and we used them in Charmaine Solomon’s Tamata Kasundi recipe. I can’t even explain how scrumptious this looks. Mmm I bet this is delicious on so many things! Since discovering your delightful posts a year or so ago I have made many delicious dishes. I especially appreciate your attributing the source of your inspiration, which has seen me head to the library or bookshop for more of the same. 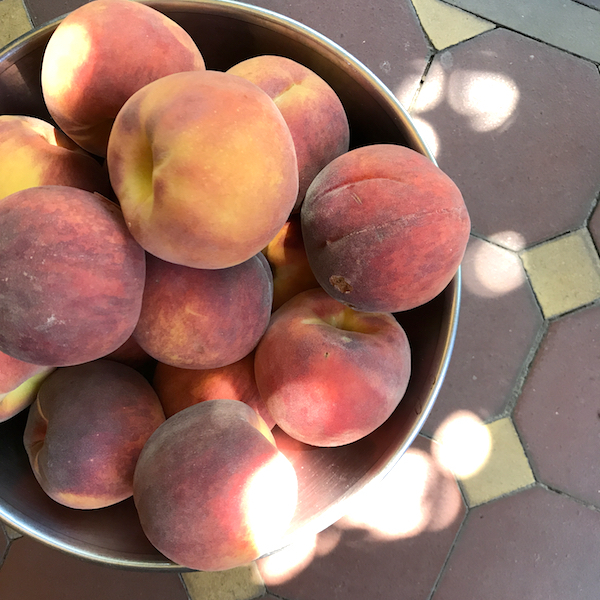 This morning as I faced a week-old pile of peaches I recalled your most recent offering – peach chutney. Thank you! Now at four o’clock I am drinking tea and admiring seven small jars of tasty chutney. Incidentally, here in Adelaide it has been unusually humid and overcast today so I can in some small way empathise with your discomfort as you deal with mountains of preserves in sultry Sydney. Thanks Linda for your lovely comment. I feel like I’ve got a message in a bottle back from the ocean of the internet. Enjoy your chutney. I’m planning to post a few more preservey things this summer, so stayed tuned!